The Atlas Learn MAGPIE2-1 complete kit is the ideal solution for smaller classrooms or boardrooms. 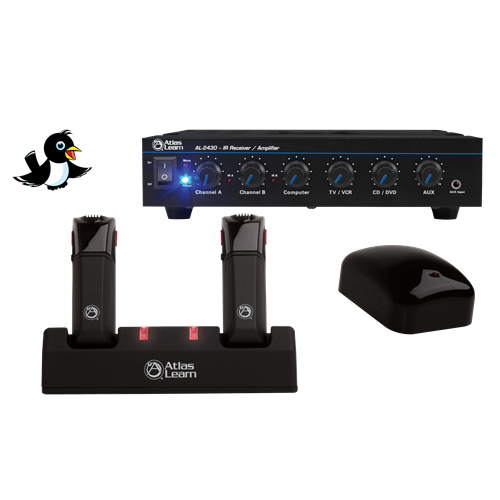 The kit includes one (1) AL2450 amplifier/receiver, two (2) AL-MAGPIE wireless microphone, one (1) AL-MAGPIE-NEST charging station, one (1) infrared dome transmitter, and ten (10) meters of coaxial cable to connect the AL-IRDS with the AL2450. This kit allows you to get all the benefits of the Atlas Learn system without paying for parts or accessories that are not needed. AtlasIED offers a full line of compatible in-ceiling and surface mount speakers that can be used with an Atlas Learn system.